Formation sign of the 20th Indian Infantry Division. The division was formed at Bangalore in April, 1942. It was commanded by Major General Douglas Gracey and at first it consisted of the Indian 32nd, 51st and 53rd Brigades. In July that year, the 51st and 53rd Brigades were detached to form the Indian 25th Infantry Division and replaced by the Indian 80th Infantry Brigade and Indian 100th Infantry Brigade (the latter brigade being transferred from the 34th Division which had recently disbanded in Ceylon). The division was intended from the start for operations in jungle and mountain and was on a Mixed Animal and Mechanical Transport establishment for maintenance in rough country. The division's insignia was a hand wielding a tulwar, in white on black. After training in Southern India and Ceylon, the Division joined Indian XV Corps at Ranchi in Bihar in December, but from July 1943, it was transferred to IV Corps in Imphal. At the start of the Battle, 20th Division was deployed forward to Tamu in the Kabaw Valley. To avoid being cut off, it retreated to the Shenam Saddle in the hills surrounding the Imphal Plain. 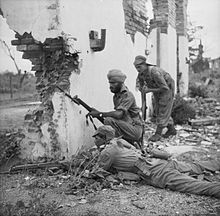 Because the 17th Indian Infantry Division was in difficulty in its sector, the 32nd Brigade was temporarily detached to t. With other detachments, the 20th Division was reduced to only five battalions, to defend the Saddle against the Japanese Yamamoto Force. During April and the first part of May, the division held the saddle against attacks by infantry, tanks and heavy artillery. It was then relieved in place and ordered to counter-attack, north-east from Imphal to Ukhrul. The monsoon had broken and movement was very difficult. After several Japanese counter-attacks, at the start of July the division was transferred to the XXXIII Indian Corps and slowly eliminated large numbers of Japanese in and around the village, which had been made into a Japanese communication and logistic centre. During the remainder of the monsoon, the division rested around Dimapur. As the monsoon ended, it moved into a bridgehead across the Chindwin River at Kalewa. It attacked southward on December 4 and cleared Japanese rearguards from Monywa. On 13 February 1945, the division made a crossing of the Irrawaddy River 20 miles (32 km) west of Mandalay. The boats used were leaky and other items of equipment already worn out. The first precarious footholds were counter-attacked every night for a week but eventually linked up into a solid bridgehead. On 13 March, the 20th Division attacked southward, gaining immediate success against the understrength Japanese 31st Division. A column formed from the divisional reconnaissance unit and an attached tank unit, known as Claudecol, reached far into the Japanese rear, before turning north and mopping up the disorganised enemy. In early April, two brigades were converted to lorried infantry by acquiring the vehicles from the British 2nd Infantry Division which was being withdrawn to India. The division fought its way southward along the east bank of the Irrawaddy, until it met units of the XV Indian Corps, which had occupied Rangoon in Operation Dracula. During this period the 22nd (East Africa) Infantry Brigade was attached to the division, from 28 June to 11 August 1945. In August 1945, the Japanese surrendered after two atomic weapons were dropped on Hiroshima and Nagasaki. The Allied South East Asia Command (SEAC) area of responsibility, was expanded to embrace several countries including French Indochina. While Chinese troops occupied the northern part of the country, Gracey's division occupied the southern part in Operation Masterdom. The division was to release former Allied prisoners of war and disarm and repatriate Japanese units. Later, the division was instructed to hand over to the returning French regime, before returning to India. There were several battles with Viet Minh, who were intent on achieving independence. Major Richard Holbrook McGregor, on Gracey's Intelligence Section Staff, learned of an impending Viet Minh terrorist invasion of Saigon. The warnings issued of the impending invasion, undoubtedly prevented the slaughter of French civilians. Gracey, never one to mince his words, criticised the French for their dismissive attitude towards his Indian and Gurkha units. The division was disbanded in India in 1946. ^ a b "20 Division units". Order of Battle. Retrieved 2009-10-22. ^ Woodburn Kirby, Vol III, Appendix 19. ^ Woodbun Kirby, Vol IV, Appendix 18. Allen, Louis (1984). Burma: the Longest War 1941–45. London: Dent Publishing. ISBN 0-460-02474-4. Maj-Gen S. Woodburn Kirby, History of the Second World War, United Kingdom Military Series: The War Against Japan Vol III, The Decisive Battles, London: HM Stationery Office, 1961. "20 Indian Infantry Division". Orders of Battle.com.